Sunday update: Kai takes out the sprints while Connor fails to back up his supreme effort in the distance race. That hands Kai the overall event title, as well as the 2015 World Series Title. So despite the barrage of attacks from guys like Casper, Mo and Jake, it’s still Connor and Kai in charge “Young Guns” for a fourth straight year. In the women’s: Fiona won the distance with Candice second, before they switched up results in the sprints. After an unorthodox tie-breaker, where the length of the sprint race course was extrapolated to match the distance race, thereby giving “comparative” times, Candice came out on top. I’ve gotta say this is the most bizarre (and probably unfair) method to decide an overall event champion that I’ve ever seen. Would have been much more fair (and entertaining) to have a race off for first. It was a small turnout at Turtlel Bay, with just 17 guys and 6 women, but at least that did include half a dozen of the biggest names in the sport. Note: The event scored 30.5% on the men’s Race Index, down from 45.0% last year, and 28.5% on the women’s, down from 32.5% last year). That drop in the Race Index score explains why most competitors saw their overall points tallies drop this weekend. Kai Lenny won Turtle Bay this year but he also won last year, so the net result is that he actually dropped points despite winning. Check out the updated SUP Racer World Rankings to see the latest rankings. The unofficial “last big race of the season” (with apologies to Paris and Perth) is happening in Hawaii this weekend, with the fourth and final stop of the 2015 World Series going down at Turtle Bay on Oahu’s North Shore. Numbers are down this year compared to last, with just four women and 17 guys competing in the distance race today, something of an anti-climax to last weekend’s Pacific Paddle Games. But while it lacks the numbers compared to other international events, Turtle Bay still has plenty of talent, with Connor, Kai, Casper and half a dozen other top ranked paddlers all at Turtle Bay this weekend. 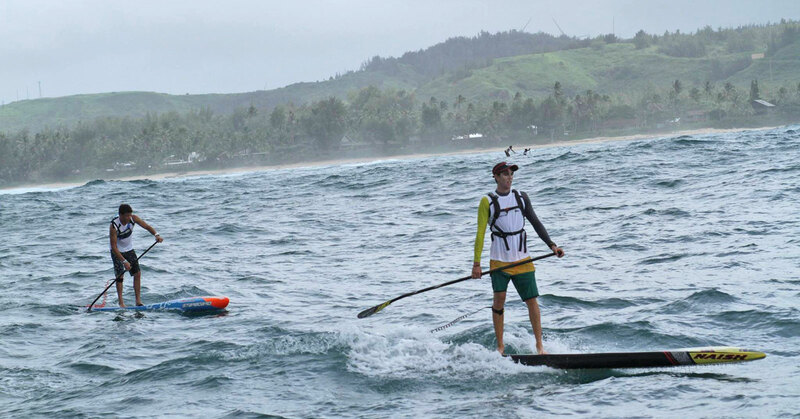 Saturday was the long distance race, from Turtle Bay to Haleiwa past several of the world’s most famous surf breaks such as Pipeline and Waimea, while Sunday it’s the surf sprints. With Angie Jackson pulling at the last minute due to food poisoning (her husband Paul got hit by the bug mid-race), the women’s field was whittled down to an elite quartet of Fiona, Candice Appleby, Sonni Honscheid and Hawaii’s Mariko Strickland. In rainy, slightly downwind conditions, Fiona used her Hood River hometown experience to milk every bump she could find, pulling well clear of the other women and almost cracking the top 10 in the men’s. Out front of the field it was no real surprise to see Connor Baxter and Kai Lenny battling back and forth. It was an even contest for the opening hour, but in the back stretch Connor put the hammer down and opened up a four minute gap. Vinnicius Martins from Brazil was very impressive in finishing third, while the unheralded Bernd Roediger, another Hood River local, took some big scalps in finishing fourth.